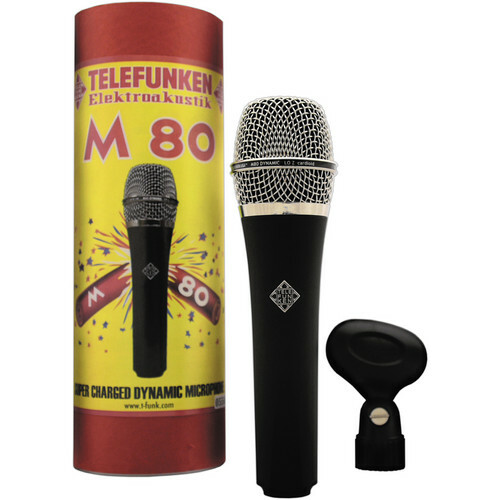 The M80 Handheld Dynamic Microphone from Telefunken is designed to deliver condenser-like audio for the stage and studio. The M80 features a low mass capsule and thin capsule membrane which deliver a wide frequency response and offer high SPL capability, allowing for use with vocals, instruments, and drums. The microphone's head grill and capsule assembly reduce proximity effect, resulting in low-end clarity for vocals while still providing strength and authority with an open, airy character. A tight cardioid polar pattern and frequency response with a subtle rise in the high end provide the M80 with characteristics suitable for live vocal applications. The package includes a microphone clip, a leather carrying case, and a packing tube. Box Dimensions (LxWxH) 10.2 x 3.7 x 3.4"
M80 Handheld Dynamic Microphone is rated 4.2 out of 5 by 5. Rated 5 out of 5 by E-Plugg from Incredible mic, way worth the investment The ELA M80 has as beautiful low silky warmth to it. Hacking a vocal channel or graphic eq to ring out monitors is not necessary for the M80. Just a high pass of about 160-180hz. very small dip @ with a tight Q @ 250hz, and a wide 1 dip @ 3.15K is mostly what you need to start off with the M80. Sometime you may have to bring 6 or 8k down 2 0r 3dB due to the brightness of the mic. but still overall a great mic. Hands down beats any dynamic mic in sound, clarity, warmth & durability. Would even stack it against a few condenser mics. Rated 5 out of 5 by Justin FOH from My new go to mic I tour with a country band as their road manager and FOH engineer. At a show we were doing a fellow engineer told me about this mic. I purchased one to try out on our lead vocal then had each of the other singers try it out. After trying multiple mics over the last two years I have finally found what I was looking for. We just purchased three more for a total of four and I have all of my guys on them now. They are amazed with the improvement and a direct quote was I feel like my voice is alive now. The feedback rejection is killer and outside of one one of my vocalists I am only using a HPF on a well tuned system. I have one vocalist that I have to fight around 3.15k but I'm noticing that I am not fighting as hard as I was when we had him on a competitors mic. The only minor complaint I have is the proprietary clip that comes with the mic. I would purchase a couple of extras if you are using them frequently. This is very minor considering it is such a great sounding and tough as nails mic. Definitely worth the money! Rated 5 out of 5 by Anonymous from Great Mic I've used the SM58 for years and decided it was time for an upgrade after doing a show where my vocals just didn't cut through. The clarity of the M80 is far superior to the SM58 and it feels like it is built rock solid. I'm still getting used to the nuances of this mic during live performances, but haven't had any issues with the change. I've read lots of reviews that these are great for recording, etc but I haven't used it for that so I cannot comment. Rated 5 out of 5 by Marcus from Best sounding mic for vocals and podcasting for the money As a professional audio engineer, this is the most natural sounding dynamic handheld mic I have heard. A little bit of handling noise, and susceptible to plosives, but nothing a mic stand and windscreen can't fix. Rated 1 out of 5 by sangeet from did not like it was very harsh sounding. in the store is sounded like it was the best replication of what i really sound like but in the concert hall it was harsh.